Fault polygons are a key component of a carefully crafted geological map. 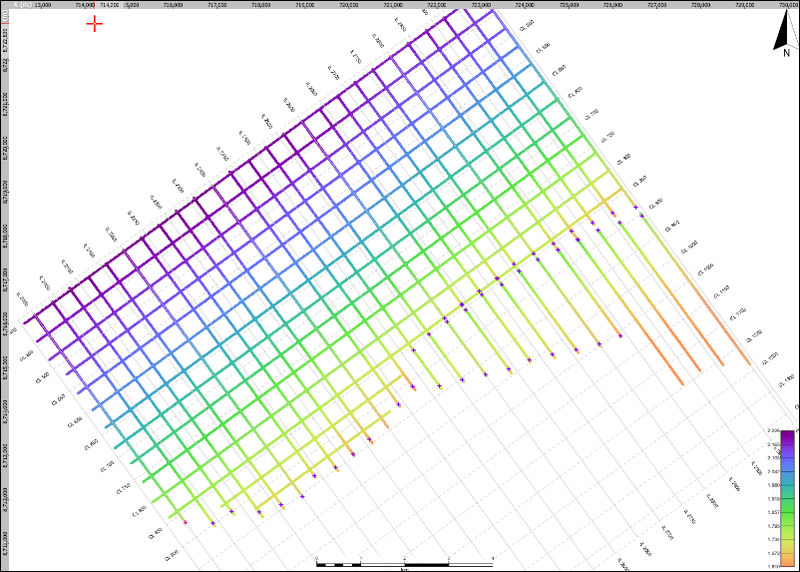 In this example, we’ll use digitised fault polygons to help guide a horizon propagation. I’ve picked a 50x50 grid horizon up to a sharp discontinuity. Seismic attributes, such as incoherence or directional correlation, clearly show my area as heavily faulted. Co-rendering attributes made the process of picking faults much, much easier. After the fault interpretation we clearly see horizon-fault intersections. I’d like to use this grid to propagate up to the discontinuity. 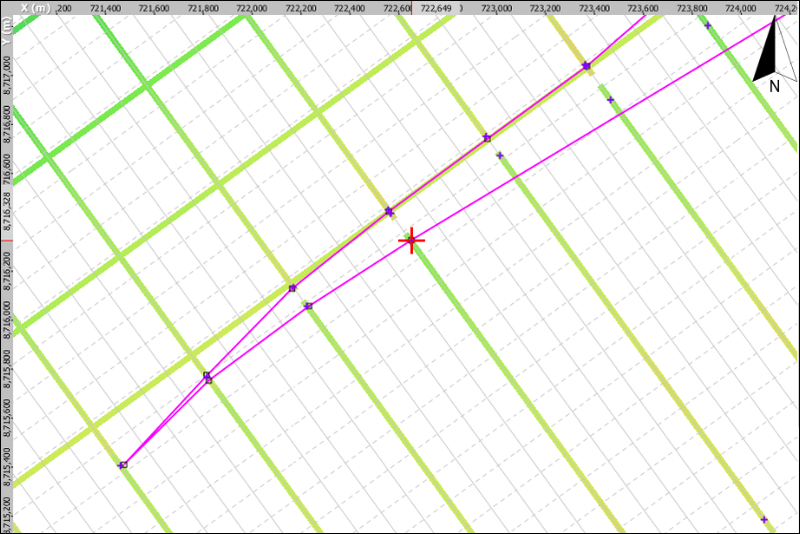 Let’s generate fault polygons based on these fault intersections and use these to constrain the propagator. In Polygon tab, select the blue button and choose New Fault Polygon. Give it a name and click OK.
Set the new fault polygon to a horizon depth by selecting a horizon in the fault details panel. This is useful when displaying the fault polygon in the 3D View. I’ve set mine to the seed horizon Top_Borde_Base_Tertiary. Toggle the pencil to start editing the fault polygon, using the fault intersections as a guide. To pick a polygon; left-click adds a pick, reposition the mouse, and left-click again to make another pick. Use the mouse wheel to zoom in and out while picking. When you’re done, double click to finish picking. 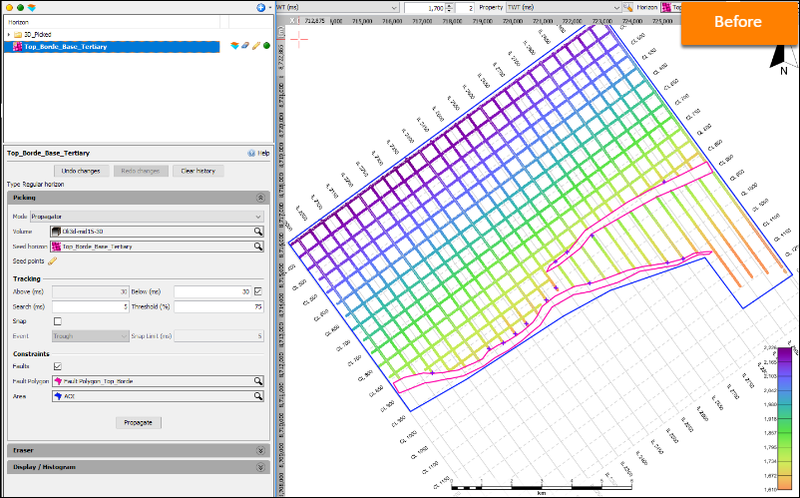 Insight supports multiple shapes for each fault polygon. Once you have completed the first fault shape, you can pick a second or third in the same fault polygon. After finishing the a shape with double-click, left click again to add a new fault polygon shape. Another option is to pick each shape as a separate fault polygon. 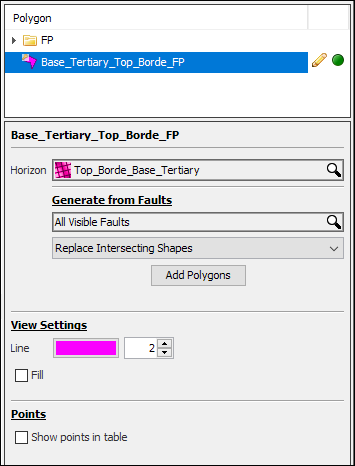 Multiple fault polygons can be combined later in the Control Panel by highlighting the polygons to combine, right clicking and selecting combine. Find out more here. It’s important to have a single fault polygon at the end of this process, so we can select it in the horizon propagator. Ensure there is no interpretation inside the fault polygon before proceeding with the horizon propagation. Interpretation inside the polygon will be used as seeds in the horizon propagation leading to a poor result. Now to configure the horizon for propagation. Create a polygon around the interpretation area and choose it in the Constraints / Area. In this example, it’s the dark blue polygon called AOI. 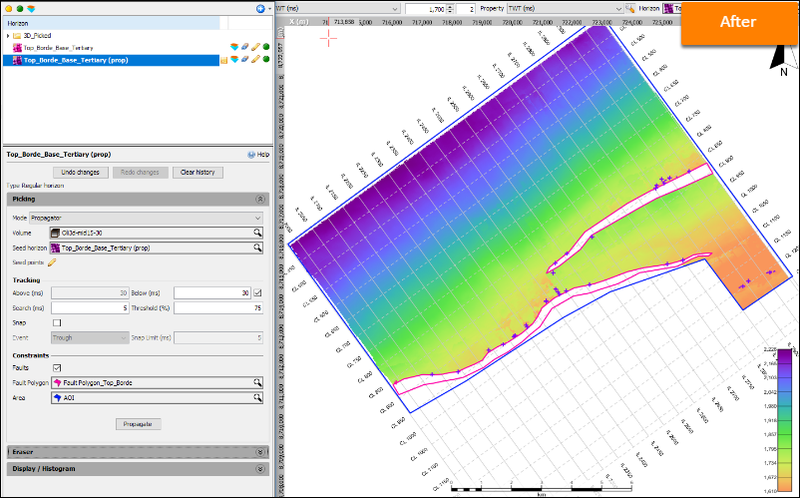 Choose fault polygon in the Constraints / Fault Polygon option in the horizon propagator and then run the propagation. Watch Insight propagate from the grid, carefully avoiding the area inside the fault polygon. Next: How do I list what’s in my session?